Stitch with Superduo and twin beads with this collection offered in two colors! Discover this ultimate collection featuring information every beader won't want to miss. Learn everything you need to know about working with shaped beads in this ultimate collection. First, learn the basics for beading with shaped beads from Melinda Barta and the appropriate bead substitutions you won't want to be without. Then, explore 11 beautiful projects that incorporate Superduo and twin beads! BONUS: You'll get a delightful bead kit that incorporates these beads available in pink and blue! 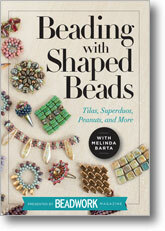 Explore shaped beads like never before with Beadwork magazine Editor Melinda Barta! This information packed workshop video includes information about how to stitch with shaped beads, important characteristics of each bead type, important substitutions, and more! Explore just how you can make stylish beaded jewelry using Tila beads, Superduos, peanut beads, and more! 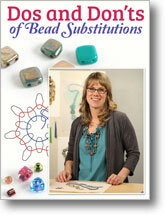 Join Melinda Barta as she goes in depth to explain important bead substitutions. Whether you're stitching an older project and can't find the materials or are looking to source beads from your home stash, this information is invaluable to every beader. Plus, with an in-depth section on substitutions for shaped beads, you won't want to be without this important information! Get all the supplies you need to make this beautiful bracelet project in one! Hurry -- Get your collection before it's gone! First, it wasn't clear to me that the webinar was not a DVD but a download and I have very slow download speed.